» Best fit parameters describing net CO2 flux light response curves measured during the ITEX CO2 flux survey 2003-2009. Ecosystem CO2 flux light response curves were measured on 1m x 1m plots ( some 0.3m x 0.3m plots in 2006 and some 0.7m x0.7m plots in 2009) across the arctic. This file contains the best fit parameters that describe these light response curves, together with corresponding NDVI data for each curve. Survey plots were located in the Toolik Lake LTER fertilization experiment in Alaska; at Imnavait Creek, Alaska; at Paddus, Latnjajaure and the Stepps site near Abisko in northern Sweden; at various sites in Adventdalen, Svalbard; in the Zackenberg valley, Northeast Greenland; at BEO near Barrow, Alaska and at the Anaktuvuk River Burn in Alaska. Measurements were made during the growing seasons 2003 to 2009. Imnavait Creek, Alaska 2003: Measurements were made on 8 flux plots in different vegetation types along the topographic sequence of the west facing slope of Imnavait Creek catchment. A light response curve was measured on each plot several times during early July and several times during late July/early August. Imnavait Creek, Alaska 2004: Measurements were made on 15 plots along the topographic sequence of the west facing slope of Imnavait Creek catchment, in the same area as 2003. A light response curve was measured on each plot once in late June/early July and once in August. Toolik Lake, Alaska 2004. 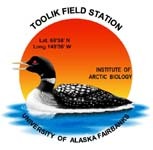 Measurements were made on a total of 20 flux plots in treatment (N +P) and control blocks of the LTER fertilization experiment at Toolik Lake, including the moist acidic tussock, non-acidic tussock, non acidic non-tussock, inlet wet sedge and heath sites. Light curves were measured on each plot once in late June/early July and once in August. Abisko, Sweden 2004. Measurements were made on 11 plots at the "Stepps" site, each measured once in July and once in August. Measurements were made on 13 plots at Paddus and 12 plots at Latnjajaure, once in July and August. Abisko, Sweden 2005. 15 plots were located at the "Stepps" site, measurements were made on 3 occasions through June/ early July and once in mid August. During the 3rd phase of measurements in June we conducted a diurnal series on five of the plots, measuring a light curve once every 4 hrs for 28 hrs. Svalbard 2005. Measurements were made on 41 plots at various sites in Adventdalen, one light curve was measured on each plot during July. Zackenberg 2006. Data were collected on 35 1 x 1m plots and 25 0.3 x 0.3m plots across a range of vegetation types. 13 of the 0.3 x 0.3m plots were located within 1m x 1m plots (identified by plot name with suffix "b1, b2 or b3"), the remainder were independent of the 1 x 1m plots (B14-25). A light curve was measured on each plot once, all measurements were made from 8 July through 1 Aug 2006. Toolik 2009: Data were collected on nine 1m x 1m flux plots, three in each vegetation type. Vegetation types included moist acidic tundra (MAT), dry heath (HTH) and wet sedge (WSG). Each plot was measured at approximately 2 weeks intervals from mid-June to mid-August 2009. Anaktuvuk River Burn 2009: Data was collected on five 0.7m x 0.7m flux plots along a burn severity gradient in mid-June 2009. Barrow 2009: Data was collected on thirteen 0.7m 0.7m flux plots along a moisture gradient during late-July to early-August 2009. We measured net CO2 flux using a Licor 6400 photosynthesis system (Li-Cor Inc., Lincoln, Nebraska, USA) connected to a plexiglass chamber. For most sites, the chamber measured 1m x 1m x 0.25m, but a 0.3 x 0.3 x 0.15m was used in 2006 and a 0.7 x 0.7 x 0.25m was used in 2009 due to limited accessibility at these sites. In Alaska in late season 2004 and at Zackenberg from 25th July 2006 onwards, we used a LiCor 6200 photosynthesis system. Flux data from the LiCor 6200 were corrected for the effects of water vapor build-up according to Hooper et al 2002. At each plot we took measurements to create a light response curve: 2-3 measurements were made at ambient light conditions, followed by 2 flux measurements at each of 3 successive shading levels, with finally 3 measurements under complete darkness. We shaded the chamber by layering 3 fine mesh net cloths and used a tarpaulin to block all light from the chamber. Flux measurements under complete darkness represent ecosystem respiration. At each light level a flux measurement lasted 45 - 60 secs in total, CO2 concentrations in the chamber being recorded by the Licor every 2-3 secs. Incident radiation, average temperature and NDVI were also measured on each plot for each light curve. A saturating (Michaelis-Menton type) function is fitted to the measured data. Best fit parameters describing each light curve are calculated by minimizing the sum of squared errors between measured and modeled NEP values. In 2003, all flux data from a plot on one day are grouped into one light curve. The unispec spectral analyzer measures reflected light intensity in 256 portions of the visible spectrum from ~300nm to ~1100nm. A foreoptic cable transmits light reflected from the target to the instrument, a measurement scan lasts for ~10ms. 9 scans were measured in a regular grid for each of the flux plots. The end of the fiber optic was kept approximately 1m vertically above the ground surface resulting in a view of the vegetation of approx. 20cm diameter. For the 0.3m x 0.3m plots, 3 scans were taken from directly above the plot with a field of view of approximately 30cm diameter. The average of these three scans was then taken. Incident radiation was measured using a reference standard in order that reflectance from the vegetation could be calculated as a percentage of incoming solar radiation. The program Multispec5.1.5.exe was used to compile Unispec reflectance spectra from the raw target spectra. The skye NDVI sensor measures total radiation reflected from the vegetation (without measuring incident radiation) in the wavebands 570nm-680nm and 725nm - 1100nm. NDVI is then calculated as below. between changes in canopy leaf area and changes in photosynthetic CO2 flux in arctic ecosystems? Journal of Ecology, 95, 139-150. Version 5: Added Toolik and Barrow 2009 data. Changed file name from 2006 to 2009. Added Comments column. Version 6: Updated metadata form to newer version (without site sheet). Missing values changed to #N/A. CH 25Jan2013 Updated to newer metadata with site sheet. CH March 2013. Definition: The maximum average PAR value under which a flux measurement is recorded for that curve.